We also emphasize that within the supplier's organization, there are usually two different teams working on the project: a sales & proposal team during definition and planning phase, and an implementation team during implementation and closure phase. Mutual support between these two teams is best practice for successful handover. In section Fundamentals of Project Management, we point out that in a real life environment, we cannot plan for everything that could happen. That might tempt us to keep planning low-key, and rather start taking action because things unfold differently from what we can plan anyway. On the other hand, poor planning documents are one important reason for bad project results in terms of additional, unplanned work, time delays, and cost overruns. Thus, the secret of excellent project management seems to be the right balance between creating detailed planning documents in planning phase while keeping enough flexibility for changes during implementation and closure phase. That sounds like a dilemma. How we are going to resolve this you will find in the sections Definition Phase and Planning Phase on a detailed level. Here, we focus on the general project management principle. Ultimately, we want to achieve the best possible project results. This we can only do by managing implementation and closure phase in the best possible way: We as project managers together with our core team members must be in control of implementing and closing the project. This is only possible if we prepare everything we need for optimum implementation and closure in definition and planning phase. "Tell me how you define and plan your project, and I tell you how it will end." The following picture illustrates the project management controlling cycle which will guide us through the whole project management process, from the first steps into defining the project, all the way to the last steps of closing the project. 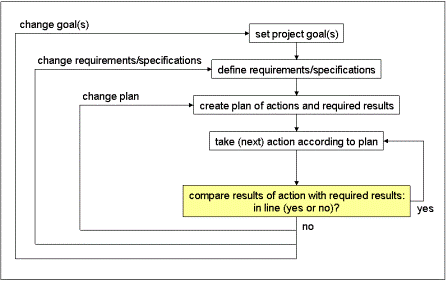 Core project management process: that is what we summarize on this page and present in detail in sections definition phase, planning phase, implementation phase and closure phase. We develop all the project management methods and project management tools to answer the basic question: What do we have to do in order to prepare and enable optimum management of implementation and closure phase? Section Definition Phase lines out how to prepare the planning phase. We focus on how to set goals, how to start the stakeholder management process and how to setup contract relationships or contract structures. In section Planning Phase, we will describe how we create a detailed project plan with enough flexibility for changes in later phases. Emphasis lies on the core project management process, risk management process, and contract management process. Additionally, we indicate how we, as project managers, can involve into the proposal management process and benefit from it, and how to include the quality management process. Section Implementation Phase goes into details of how to follow the plan and deal with necessary changes. Here, we go into details of the application of controlling tools and change and claim management. Since we sometimes face crisis especially in implementation phase, we also present the basics of the crisis management process and problem solving processes. In section Closure Phase, we describe how to conclude all the project management related processes, and how to collect and evaluate the lessons learned.